XAMPP is an easy to install Apache distribution containing MySQL, PHP, Perl and more. XAMPP is really very easy to install and to use - just download, extract and start. XAMPP is one of the many solutions when you want to run Website@School on your own your Linux, Mac, Solaris or Windows computer. Please see http://www.apachefriends.org/en/xampp.html for details and downloads. The philosophy behind XAMPP is to build an easy to install distribution for developers to get into the world of Apache. To make it convenient for developers XAMPP is configured with all features turned on. The default configuration is not good from a security point of view and it's not secure enough for a production environment - please don't use XAMPP in such environment. 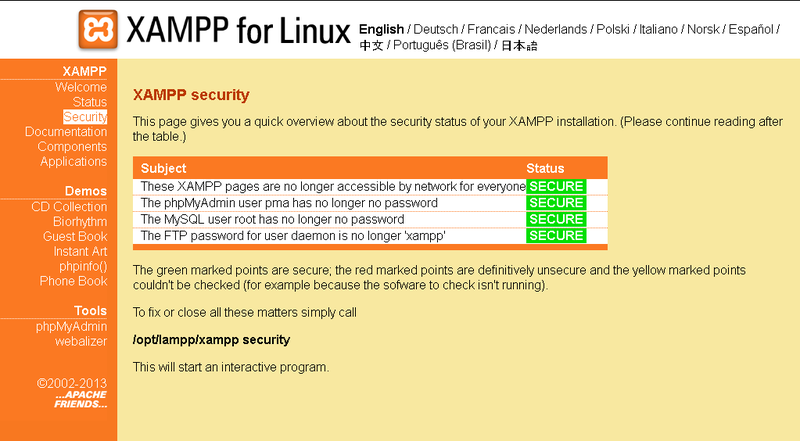 Since LAMPP 0.9.5 you can make your XAMPP installation secure by calling »/opt/lampp/lampp security«. XAMPP may be easy, but every type of installation may or may not have it's own quirks. That's why we describe a couple of installations up to the level where Website@School is actually working. Please help us by creating an installation guide for Mac and Windows. The installation of XAMPP was performed on a HP d530 with a P4 3.2 GHz processor, 2 GB RAM, on Ubuntu 10.04 LTS, xampp-linux-5.6.3-0-installer.run 32 bits version. The installer is user dirk on a PC called c36. Window: Setup - XAMpp: click [Next >]. Window: Select Components: both components stay checked. Click: [Next >]. 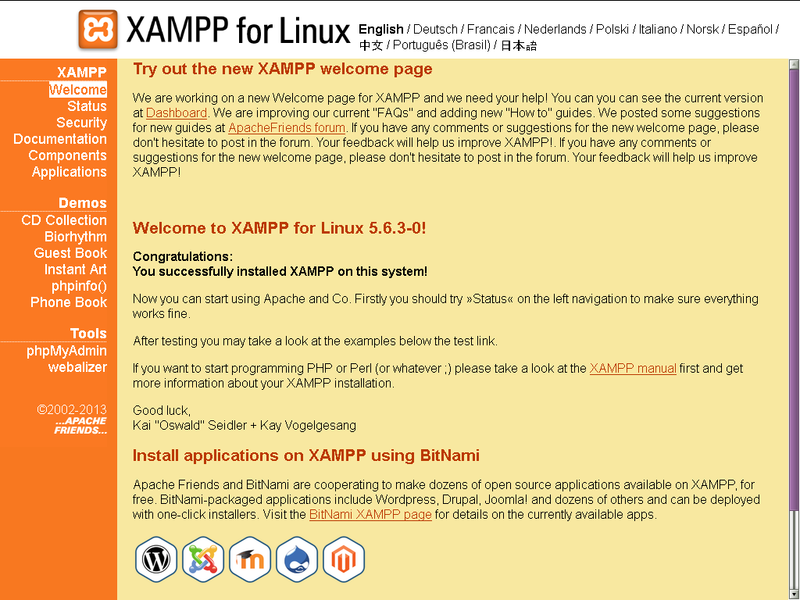 Window: Installation Directory: XAMPP will be installed to /opt/lampp. Click: [Next >]. Window: Bitami for XAMpp: uncheck 'Learn more about Bitami for XAMPP'. Click: [Next >]. Window: Ready to install. Click: [Next >]. ... the 'Completing the XAMpp setup wizard'	becomses available. UNcheck the 'Launch XAMPP' box. We will start/stop XAMPP manually. Now you have returned to the terminal. Open a browser and surf to http://localhost/. You should see the 'XAMPP' splash screen. Now shut down your Linux box and star up again. This forces you to manually start XAMPP. It's an extra check. Better to check now than hours, days, month later find out ... @Q!@#$%!! In the left XAMPP menu select 'Security'. Read the instructions and observe that the installation is insecure. XAMPP:  MySQL is accessable via network. XAMPP:  Setting new MySQL pma password. sure you won't forget it!!! XAMPP:  Setting new MySQL root password. XAMPP:  Change phpMyAdmin's authentication method. Copy the websiteatachool-<version>.zip to the directory and unzip. In the XAMPP menu under Tools, select phpMyAdmin. Click [Databases]. At 'Create database' enter, for example, localwas. Do not use this common name. Click [Create]. In the phpMyAdmin left menu the database is added. Copy websiteatschool-<version>.zip and the manual to /opt/lampp/htdocs/. Unzip both. Go http://localhost/was/program/install.php. You see the first install page. Start the installaton. Please see chapter Installation, section 2. The installation. Please help us with instructions! It is true that the last step in the installation takes quite some time. Maybe it can be solved in a future release by letting the program ask for extra exection time. The installation fails because 30 seconds apparentlly is not enough to complete the installation. Reasons can be: - The installation takes time because of the huge amount of Demonstration data (The Exemplum Primary School, users, Areas, sections, pages, modules, etc). - The PC is too slow for the default 'max_execution_time' of the file php.ini, which is set to 30 seconds. - Raise 'max_execution_time' in php.ini. In file ../program/lib/usermanager.class.php, go to line 427 and 726 and look for password_hash( (do not forget the brace!). Change 'password' in, for example, 'pazzword'. Save. Do exactly the same in ../program/lib/loginlib.php on lines 869, 1035, 1114, 1144 and 1176. Save. The login screen is now accessible.